Hidden Canyon is the drainage that is observer's left of Brighton's Great Western chairlift. 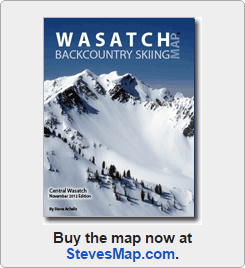 It is frequently skied by lift-accessed skiers and as such, it can get tracked-out quickly. Brighton recently purchased Hidden Canyon and will undoubtedly build a chairlift to make Hidden Canyon part of the Brighton ski area. It is disappointing to see another beautiful valley on its way to becoming a ski resort. It's also a good reminder to protect the little public land that remains. Hidden Canyon contains complex avalanche terrain that includes dense trees (especially on the slope that adjoins Brighton), chutes, and cliffs. The fact that you can ski much of the terrain as lift-served sidecountry makes it tempting yet hazardous—sidecountry is backcountry! There are several ways to access Hidden Canyon. The obvious option is to ride Brighton's Great Western chairlift, exit the backcountry access gate, and ski toward the Hidden Canyon Saddle . You can drop in before the saddle to ski Brown Spot or Cheese Grater, or you can boot up toward 10420 and ski Sunny Glades. Another option is to ride Great Western, ski down the in-area Elk Park Ridge run, and ski off the ridge into Hidden Canyon. A third option is to follow the route toward 10420 from the Guardsman trailhead	via Brighton Hill and drop into Hidden Canyon anywhere along the way. If you do access Hidden Canyon from Brighton, be sure to bear left with the majority of ski tracks as you near the bottom of Hidden Canyon so you return to Brighton. 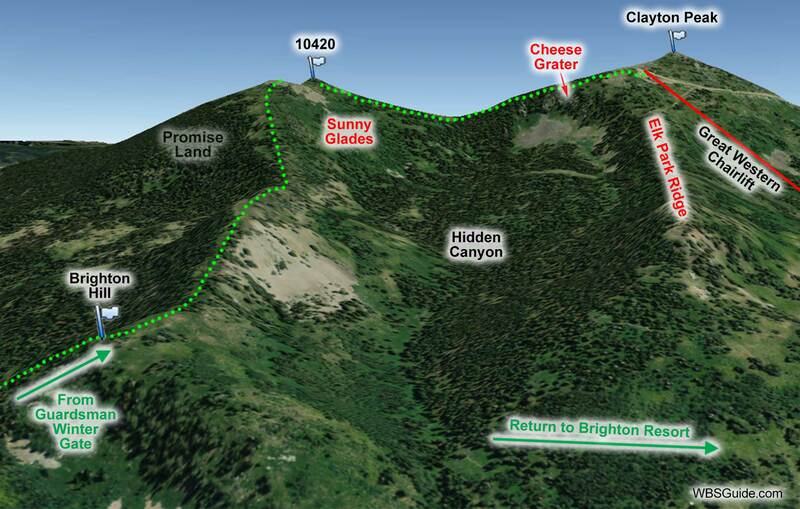 If you miss the turn-off, you can end up near the Brighton store (at the entrance to the Brighton loop). If you ski Hidden Canyon from the Guardsman gate, you'll need to skin back up to your car.